A debt crisis does not come slowly and predictably. This year's short term bond holders, a very risk averse lot, are mostly interested in whether next year, new bondholders will show up, to lend the government money to pay this year's bondholders back. Bondholders can run on small jitters over that expectation. When bondholders get nervous, they demand higher interest rates. More than higher interest rates, they diversify their portfolios, or just refuse. Debt gets "hard to sell" at any price. A different class of bondholders, willing to take risks for better rates, must come in to replace the safety-oriented clientele that currently holds short-term government debt. As interest rates rise, interest costs on the debt rise. At $20 trillion of debt, when interest rates rise to 5%, interest costs rise to $1 trillion dollars, essentially doubling the deficit. That makes markets more nervous, they demand even higher interest rates, and when that spiral continues, you have a full blown debt crisis on your hands. Short term debt compounds the problem. Since the US has borrowed very short term, interest increases make their way to the budget more quickly. If the US had borrowed everything in 30 year bonds, the spiral mechanism from higher rates to higher deficits would be cut off. The crisis typically comes in bad times -- when in a war, recession, or financial crisis, the government suddenly needs to borrow a lot more and markets doubt its ability to repay. But there is a case for a crisis to happen in good times as well. We have known for decades that the fundamental US problem is promised entitlement spending far beyond what our current tax system can fund. Markets have, sensibly I think, presumed that the US would fix this problem sooner or later. It's not that hard as a matter of economics. Well, say markets in 2005, OK for now, you have a war on terror and a war in Iraq on your hands, we'll trust you to fix entitlements later. Well, say markets in 2012, OK for now, you're recovering from a massive financial panic and great recession. We'll trust you to fix entitlements later, and we'll even lend you another $10 trillion dollars. But what's our excuse now? At 4% unemployment, after 8 years of uninterrupted growth, if we can't sit down now and solve the problem, when will we? Markets have a right to think perhaps America is so fractured we won't be able to fix this in time. Or, more accurately, markets have a right to worry that next year's markets will have that worry, and get out now. All this is well known, and most commenters including me think that day is in the future. But the future comes often quicker than we think. With that prelude, two pieces of news strike me as distant early warning signs. 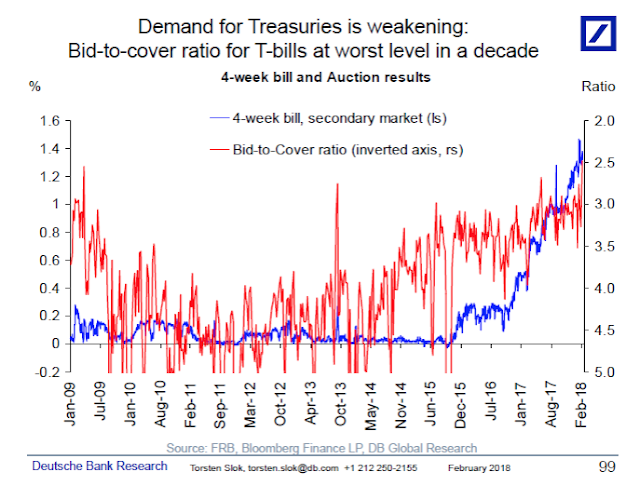 Here, from Torsten Sløk's excellent email distribution are two graphs of the bid-to-cover ratio in Treasury auctions. The first chart below shows that the bid-to-cover ratio at 4-week T-bill auctions is currently at the lowest level in almost ten years.... demand is also structurally weaker when you look at 10-year auctions, see the second chart. The main risk with issuing a lot of short-dated paper such as 4-week T-bills is that in 4 weeks it all needs to be rolled over and added to new issuance in the pipeline. In other words, the more short-dated paper is issued, the bigger the snowball in front of the US Treasury gets. Things are so far looking ok, but the risks are rising that the US could have a full-blown EM-style fiscal crisis with insufficient demand for US government debt, and such a loss of confidence in US Treasury markets would obviously be very negative for the US dollar and US stocks and US credit. The fact that this is happening with a backdrop of rising inflation is not helpful. Investors in all asset classes need to watch very carefully how US Treasury auctions go for any signs of weaker demand. The last part is the mechanism I described above. As an ivory tower economist, I tend to overlook such technical issues. 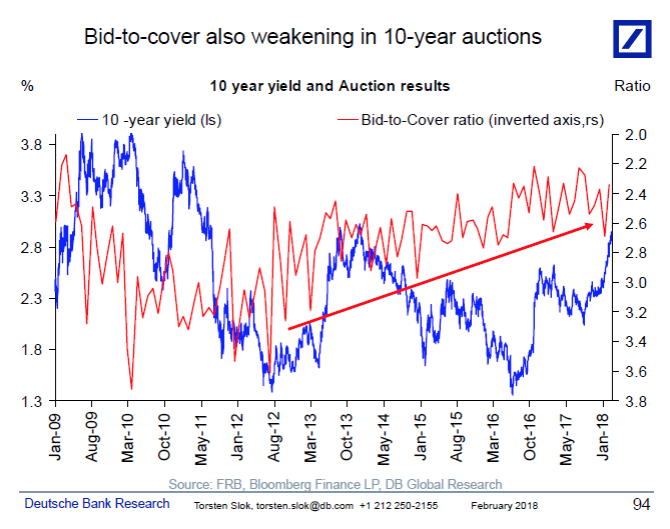 If the bid to cover ratio is low, well, then that just means we need higher rates. But higher rates aren't a panacea as above, since higher rates make paying it back harder still. As I look at debt crises, also, it isn't just a matter of higher rates. There comes a point that the usual people aren't buying at all. Again, we're not there yet, and I think we have a long way to go. But this is a little rumble. The second tremor is Why International Investors Aren’t Buying U.S. Debt in the Wall Street Journal. The overall message is also that international investors are getting nervous. US 10 year yields are 2.9% already. German yields are 0.68%. Why aren't people buying our debt? Well, number one, they are worrying a further slide in the dollar. Which comes when next year's international bond holders really don't want to hold US debt. All to follow up on for another day. Mostly, it rang a bell as a little tremor that people who answer WSJ reporter's phone calls are expressing nervousness about US debt. Again, these are little rumbles. I still think that a full blown crisis will come only amid a large international crisis, featuring some big country defaults (Italy? ), big financial trouble in China, perhaps a war, state and local pension failures, and the US comes to markets with unresolved entitlements and asks for another $10 trillion. But I could be wrong. We live on an earthquake fault of debt, and the one thing I know from my own past forecasting ability (I have lived through 1987, the dot com boom and bust, 2008, the recent boom, and more, and saw none of them coming in real time) that I will not see it coming either. Update: Reply to Benjamin Cole, below. The US has never spent less on defense, as a fraction of GDP or of the federal budget, than it is doing today, since the 1930s. Here is defense / GDP. Defense / federal budget is even less, as the budget has expanded as a share of GDP. The fact that the Fed is talking about four interest rate increases in the next year is probably having some effect on the willingness of bond investors to buy now. We can default smoother than last two times, we get better at it. In 73 we had about 8 years of very high inflation, but eventually rebuilt finance. I say we target about 5 trillion in defaults over the next decade. A robust market for discounted sovereign debt helps, it can target the inflation rate, keep it ay 5% for a decade. Congress will go along, they won't have a choice. Unorganized default is the worst outcome. Trust the wsj to complicate a straightforward concept... German investors care about their returns in euros, not in dollars. But because of the large differential in overnight rates, it is very expensive to hedge their dollar investments back to euros. North of 2.5% right now. In fact, 10 year US treasuries look “rich” (lower yielding than bunds) when this is taken into account, as German rates have also risen recently. As always, appreciate the commentary. While there are a lot of headwinds for rates to rise, I fully agree that financial crises happen only when investors have grown complacent about known risks. I agree with the thrust of this post, though some attention paid to runaway "national security" spending would help. At current rates, nominal national security spending will double in 10 years. The US spends about 50% more, in real terms, than in the Reagan days, when we faced a bona fide military adversary. On economic threats: I suspect we have a leader for life in China, and he has been extending his reach into every large China company, public, private or state. Can mercantilist China prosper with central economic planning, gathering and extensive state control of everything, but a growth-oriented central bank? We will see if their economic model can work. They are now 15% on global output. On the US national debt, it looks bad. But the Bank of Japan has bought back 45% of outstanding JGBs, and they still can't hit 1% inflation. Indeed, 10-year JGBs yield close to zero. The yen has been appreciating against the dollar. I have not yet heard a sensible explanation of the Bank of Japan and the lack of inflation. Some say "Well, the BoJ plans to buy back those bonds." When would that be? So maybe there is an escape hatch. The Fed can buy the debt back. Interest payments will flow through to the Treasury. Call it Mobius Strip Economics. In the next recession, we will hit zero bound rather quickly. That would be a great time to re-fi as much as possible, and for the Fed to buy back bonds by printing a lot of money. There are lots of serious people who say QE is not inflationary. Fine by me. I see no other way of out the pending debt bomb. Benjamin, when people say that QE is not inflationary, what they mean is that it is not as long as the Government debt is paid for. Because the money used to buy the bonds is absorbed back again when the Treasury taxes to pay the Fed. Furthermore, as long as people believe those bonds will be paid for, the Fed could always stop inflation by selling the bonds and soaking up money. If there is a default, or simply the risk, then the Fed has printed money that cannot be pulled back. It printed money to pay debt basically, monetary financing. The Liberty Fed study shown here clearly supports the idea that the Fed will stop inflation, protect bonds, and kill the stock market if need be. http://www.talkmarkets.com/content/bonds/bond-vigilantes-liberty-street-fed-collateral-study-and-art-cashin?post=167584 The question I have is about Eurodollars. Apparently treasuries and eurodollars are being shorted like no tomorrow. If the Fed has no control over eurodollars, could that be inflationary and render my article incorrect? I personally believe the Fed will be protective of the collateral. But others say it won't invert the yield curve, and won't do what is necessary to stop inflation. Personally I think the Fed could wait to allow more prosperity before clamping down, but these shorts must be unnerving markets. They are morons. Does the US assess defence spending as including the cost of pensions and medical care for retired servicemen? Who is assumed to pay for the FBI? The US or Russia? The 10 year fell 6 basis points today on the news of tariffs against steel and aluminum. Wouldn't the logic of this post identify that decline as an increase in market confidence in U.S. debt? "We have known for decades that the fundamental US problem is promised entitlement spending far beyond what our current tax system can fund." I understand that this depends on the definition of "current tax system". Our current tax rates won't cover it, but the Obama rates weren't that far off. Quantitatively, how big a raise would it take to fund our current social spending obligations? Maybe the Trump tax cut wasn't such a hot idea after all? Not even close. Entitlements grow by at least 5 percentage points of GDP in the next decades. The trump tax cut lowers revenue maybe 0.4% of GDP on average for the next decade, and that doesn't count rises in GDP if it has growth effects. On net, CBO is still forecasting the trump tax cut raises taxes/gdp by 2025 relative to now, and that's before the temporary stuff expires. Basically the revenue effects of the tax cut are nickels and dimes compared to what's needed to pay for entitlements. The last CBO long term budget scenario I read said that paying for entitlements would need (if memory serves) 60% or more top end federal personal income tax rates. Sobering. The warning signs are not so distant. Weak demand for treasuries and market volatility. The looming domestic crisis isn't the request for ten trillion. It may be for much more. Will debt go to 150% of GDP in 12 years? Still, the rational expectations investor takes the longer view. They don't lower the discount rate used to value future cash flows. They assign a higher equity risk premium in that environment. It would be wise to think about cryptocurrency as a hedge against a 5 sigma event. The second order effects are substantial as well. My quick read of the chart is that is excludes VA outlays. This is a like a police department budget that excludes pension payments to a large legacy of very entitled retirees. The VA is not cheap: "In the FY 2019 Budget, President Trump proposes a total of $198.6 billion for the Department of Veterans Affairs (VA)." $200 billion a year for the VA. Ouch. In addition, the US economy is much larger than in previous epochs. I have never liked the, "We should allocate 5% of GDP to function a," be it defense spending or not. If the US economy grows, then we are allocating more and more to function a, regardless of need. We should allocate the minimum possible. Ideally it would be zero, as defense spending is regarded by classic economists as parasitic. Okay, the world is not a nice place. So we need some measure of national defense. I would like a Bain or McKinsey or some outfit be tasked with this: What is the minimum amount the US could spend, and still be reasonably sure we have dissuaded anyone from trying to invade and occupy the US? As for foreign entanglements and keeping shipping lanes open----is not a libertarian view that if shippers want to keep shipping lanes open, they should hire gunboats? Sometimes I suspect the US national security complex has become a guard service for globalist multi-nationals or a tax-financed instrument for federal foreign policy "experts." Are any federal boondoggles more expensive than foreign federal boondoggles? That $200 billion VA budget? That works out to about $620 from every US resident (200 billion divided by 323 million). If you live in an average family of four, your family just gave the VA $2,480 in income taxes…this year. More next year. And the year after that, in perpetuity…well, as long as you live…. You're making my point exactly. The source of spending is pensions and health care, including those in the military. It's not tanks and planes. I still take issue with some of your sentiments, but let that go. The real point, which we do agree upon, is that the US will run substantial federal budget deficits for as far as the eye can see. At this point, we must devise monetary policies that work with the facts on the ground. This is what I am hoping to see from all stripes of monetary bloggers. How to "handle" the huge pending debts? Forget borrowing and go to money-financed fiscal programs? Or regular QE, continuously, ala Japan? Shoot for moderate inflation, in the 4%-5% range? Perhaps only palliatives, and not curatives, are available. Sell citizenships? Tax imports and land? Charge multi-nationals for global guard services? (okay, these are not monetary policies, but interesting to think about). Sure, we all agree the federal budget should be balanced, or close to it. That is not on the table anymore. This Post is a relevant contribution in my view, since the current environment requires new analytical tools, leaving supply/demand and mean/variance schemes behind. This Post offers useful hints as to where to proceed to. As: "But higher rates aren't a panacea as above, since higher rates make paying it back harder still. As I look at debt crises, also, it isn't just a matter of higher rates. There comes a point that the usual people aren't buying at all.". And: "Or, more accurately, markets have a right to worry that next year's markets will have that worry, and get out now. All this is well known, and most commenters including me think that day is in the future. But the future comes often quicker than we think.". And finally: "As interest rates rise, interest costs on the debt rise. At $20 trillion of debt, when interest rates rise to 5%, interest costs rise to $1 trillion dollars, essentially doubling the deficit. That makes markets more nervous, they demand even higher interest rates, and when that spiral continues, you have a full blown debt crisis on your hands." The latter point is where the amount of financial wealth (including Fed reserves, yes!) do matter, not just for asset pricing but also for macroeconomic analysis. Finally, I would suggest not to use the term "crisis" anymore, since our politicians decided that financial markets must move from one excess to another, possibly opposite, excess: in that perspective, 2017 could be interpreted as a "crisis" (a "melt-up") and 2018 could just be "normalization", and then "good". It has still to be understood that "markets going up" is not equivalent to "everything is ok". Entitlement reform will never happen - it's political suicide. - inflation stimulates R&D and infrastructure investments potentially solving the health cost crisis. That of course if the global economy doesn't blow up. It shouldn't since the US is a smaller share of world GDP these days. One point that is fairly regularly ignored is that good times can trigger a crises as well as bad, and maybe more so. US borrowing costs plummeted during the Great recession with lower tax revenues and rising deficits, with the most obvious answer being 'where else are you going to put your money?' A rebounding economy puts pressure through opportunity costs, who wants a 2.5% yield when the markets are churning out returns 2-3x that rate in all but the worst years? This is my view of the bond vigilante issues in the 80s, it wasn't the exploding deficits, it was the deficits plus the opportunity cost of hanging around in government bonds while the stock market soared. "The US has never spent less on defense, as a fraction of GDP or of the federal budget, than it is doing today, since the 1930s. Here is defense / GDP. Defense / federal budget is even less, as the budget has expanded as a share of GDP." That's great, except the government doesn't have a monetary claim on all of GDP. The proper way to look at this is from either a defense spending as a percentage of total spending perspective (how much does government prioritize defense) or defense spending as a percentage of tax revenue.